يشكل فندق Barossa Motor Lodge Motel بموقعه الممتاز في قلب تانوندا نقطة انطلاق ممتازة لاستكشاف وادى باروسا. يمكن من هنا للضيوف الاستمتاع بسهولة الوصول إلى كل ما تقدمه هذه المدينة النابضة بالحياة. يضفي محيط الفندق اللطيف وقربه من باروسا بولاند + ميني جولف, بيتر ليهمان, نبيذ سيمباتيكو سحراً خاصاً على هذا الفندق. إن الخدمات الممتازة وحسن الضيافة العالي في Barossa Motor Lodge Motel تجعل إقامتك تجربة لا تنسى. يمكن لضيوف الفندق الاستمتاع بالميزات التالية على أرض الفندق: واي فاي مجاني في جميع الغرف, مرافق مخصصة لذوي الاحتياجات الخاصة, تخزين الأمتعة, واي فاي في المناطق العامة, صف السيارات . في الفندق غرف نوم يتجاوز عددها 40، كلها مجهزة بعناية وجمال وبعضها مزود بـ تلفزيون بشاشة مسطحة, اتصال لاسلكي بالإنترنت, اتصال لاسلكي بشبكة الإنترنت (مجاني), غرف لغير المدخنين, مكيف هواء. سواء كنت من محبي الرياضة أو كنت تتطلع لتفريغ عناء نهار صعب، ستجد خدمات ذات مستوى عالي بانتظارك كمثل حمام سباحة خارجي, سبا, ملعب تنس, حديقة. إن Barossa Motor Lodge Motel هو مكان مثالي للمسافرين الذين يتطلعون إلى الراحة والاستجمام في وادى باروسا. Friendly staff and excellent service. Large clean room, a little dated but more than comfortable. Undercover parking for each room. Dinner in the Restaurant was good with good service. Breakfast the next morning was well worth it. The facilities were clean and large. The fill in managers were friendly, helpful and warm. Big and clean room. Every unit has a covered parking space available, on the opposite side of the room you see through large glass doors into the countryside. The village centre is 1.5 kilometres away and can easily be reached on foot. There you will find many cosy coffees, as well as some real gourmet restaurants. The nearest bakery is only 500 metres away, and there you find delicious, freshly prepared sandwiches and crispy German bread. Our room , and amenities were very clean and the bed comfortable. Staff obliging and friendly. I had mistakenly booked for 1 night when i needed 2 for a work trip. Being school holidays there were no other available rooms or accommodation anywhere else in Tanunda. Later on the first day i received a call back from the Motor Lodge to say that a room had become available; needless to say i booked it immediately. They went above and beyond to find me a room and remembered the predicament i was in. Will book again! Room was spacious and comfortable to spread ourselves out - ideal for families on a budget. Everything was dated (in the '90s) style but hosts were honest down to earth people who gave us good 'no frills' accommodation & meals at a reasonable price. The owners were rather contrary and not very pleasant. Otherwise, the motel was sufficient for purpose. We left $60 worth of food and drink in the fridge. They did not call to advise and when I realised a couple of hours later and called they advised it had been thrown out. They then called back as they found it the laundry fridge. If they had called when the cleaners finished they could have called as we stayed in the district all day. We only keep on perishables left in the rooms for 1-2 months, in case the guest telephones us in regards to lost property. Our motel policy is that all food stuffs left behind are binned regardless of whether they are opened or not, re OHS and possible contamination concerns. Unfortunately our cleaner does not work long hours on Sundays and did not advise that food had been left in that room. Grosse, sauber und frisch renovierte Zimmer. Vor dem Eingang steht ein gedeckter Parkplatz zur Verfügung, auf der gegenüberliegenden Zimmerseite sieht man durch grosse Glastüren ins Grüne. Wir empfanden die Besitzer als sehr hilfsbereit. Das 1,5 Kilometer entfernte Ortszentrum kann man in 20 Minuten gut zu Fuss erreichen. Dort findet man viele gemütliche Kaffes, sowie einige echte Schlemmerlokale. Zur nächstgelegenen Bäckerei sind es sogar nur 500 Meter. The motel has all the usual facilities and is in good condition with good service. The location is reasonably central to the Barossa Valley but not right in the middle of town. The rooms and beds were ok. The undercover car park was a plus, but the neighbours car is outside your bathroom etc. so if they smoke beside their car - in comes the smoke! yuck! Even with closing the windows. It is a little bit away from the main shopping area. Seen better days. having somewhere to sit outside and socialise is really good. Have stayed a few times before. 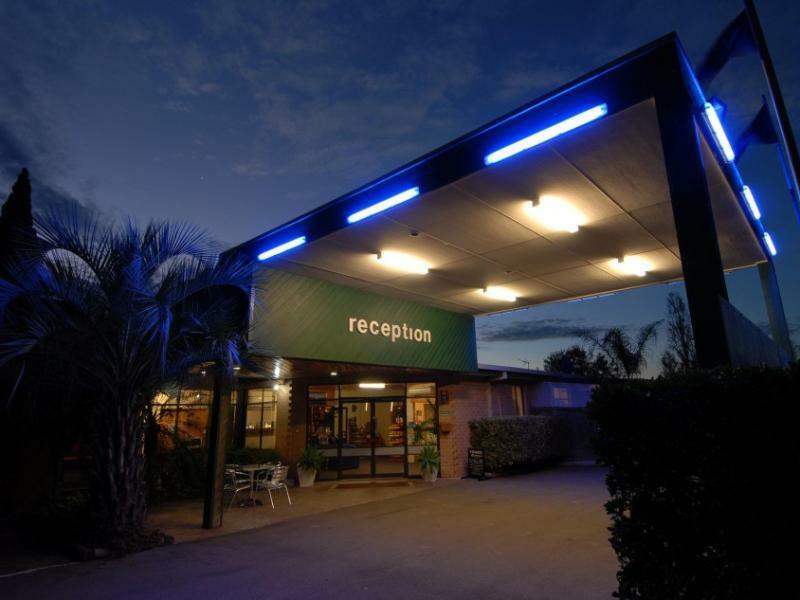 Unfortunately our stay in lovely Tanunda was short but the motel was situated in a very convenient location.We cannot comment on the food or other services because we spent very little time at the motel as we used it as a base to visit relatives. Swimming pool, helpful staff, parking in the shade. We had a pleasant stay in a conveniently placed motel for the vineyards. Very grateful for the pool in the heat wave we had. Found the A/C a bit noisy for sleeping purposes. The restaurant was closed for the time there so cannot judge it- hence the comment as no correct choice.